Visit Tikal by Bus departing from Guatemala City or Antigua. This is the most economical way to travel to this great national park. This personal encounter with the lost world shall be a truly unforgettable experience. Tikal national park. The park covers 222 square miles among the thick tropical jungle of El Petén, created in 1958. UNESCO declared the park a "World heritage site". it is regarded as one of the most important cultural and natural reserves in the world. Collective shuttle transportation from Antigua or Guatemala City to the bus station in Guatemala City. Collective Pullman transportation from Guatemala to Santa Elena, Peten. 09:00 a.m. Four hours walking tour with English speaking guide and entrance fee starting the trip inside the archeological site observing the model of it, then visiting the complex Q & R, Main Plaza, North and South Acropolis, complex of the Lost World, Temples I, II, III y IV. 14:30 Transportation to Flores and rest of the afternoon free. 20:00 Check-in by yourself at the bus station office desk in Santa Elena. 21:00 Departure from Santa Elena to Guatemala City. 05:00 a.m. Arrival to Guatemala bus station. 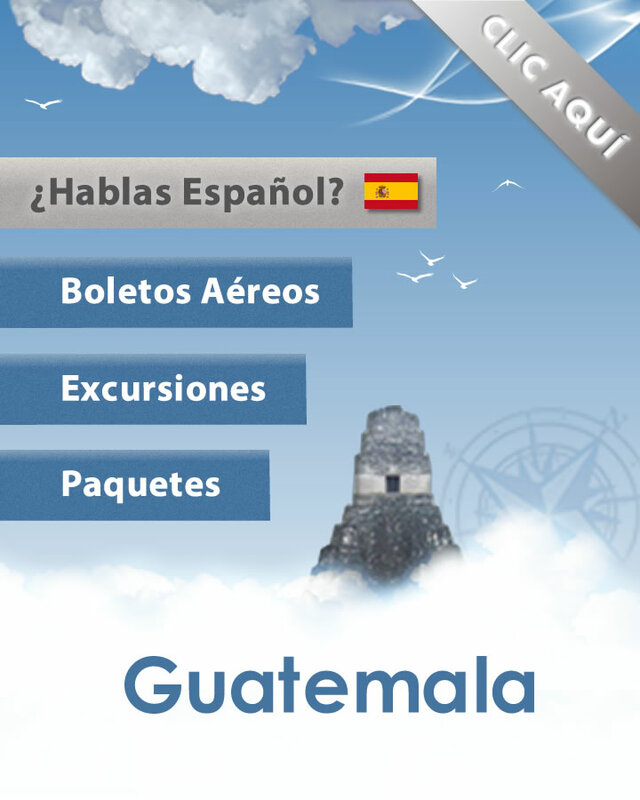 Collective shuttle transportation from the Central Bus Terminal to Guatemala City or Antigua. End of our services. The climate is hot and humid, it is recommended to dress comfortably, comfortable shoes, a small blanket or sweater for the road; as the bus is equiped with air conditioning. To reserve this tour please contact us with the Tour reference number TB-1. This is a two day tour includes one night in Flores Peten. It's a bit more relaxed tour than the Tikal by Bus Plan A. Arrival to the bus at the Terminal in Santa Elena and then transportation to the hotel. One night accommodation in Flores . Departure to the archeological site of Tikal. Four hours walking tour with English speaking guide and entrance fee starting the trip inside the archeological site observing the model of it, then visiting the complex Q & R, Main Plaza, North and South Acropolis, complex of the Lost World, Temples I, II, III y IV. .
Transportation from Flores to the Santa Elena where we will drop you off at the bus station. Transfers to hotels located outside of Flores Center or Hotel area have an additional cost. To reserve this tour please contact us with the Tour reference number TB-2. All tours require reservations and payment in advance.